The falls are visible downstream from the bridge on Mill Rd. You can also bushwhack down to the base of the falls by returning 100 feet east down Mill Rd and then heading over towards the brook. 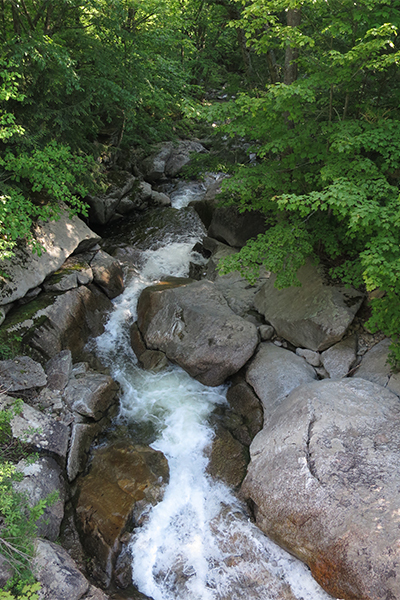 You'll need to do some light scrambling and rock-hopping to make your way upstream. Don't try to bushwhack directly over to the falls from near the bridge as vegetation is thick there and there are some steep and dangerous drop-offs along the edge of the brook. From the junction of MA 2 and MA 8 in North Adams, Massachusetts, drive 4.7 miles north on MA 8 and turn left onto Mill Rd. Take note that MA 8 crosses into Vermont after 3.6 miles and automatically turns into VT 8 north and VT 100 north. If you are traveling south from Readsboro, Mill Rd will be on your right 7.0 miles beyond the junction of VT 8 and VT 100. Drive 1.7 miles west on Mill Rd and the falls can be seen on your left just downstream of a bridge on the road. The bridge and falls are very close to where Mill Rd passes by Old County Rd on the right. Traffic is very light here so it's probably OK to park off to the right side of the road just beyond the bridge.